Being a Southern boy himself, Jane felt obliged to show Rusty around a little, even offering him his couch for a couple nights, until Rusty’s constant inebriation made that situation untenable. But Jane was determined to put his coin where his teeth was. He took Rusty along to friend Scott Thomas’ (RINGSIDE) birthday party, where Rusty fell asleep in the musician’s bathtub; discovered the next morning by Thomas’s eight year old daughter. But the two hit it off well enough (Rusty and Scott, not the kid) for Scott to agree to take Rusty over to producer and engineer Max Allyn’s Dig It! Studios, and the rest, as they say, is his story. But get it done they did. The third time Jane stopped by, he found the tired but elated producer combing through a mountain of tracks. “We got her done,” Allyn said. But Rusty Blades was “gone when I woke up. I don’t know how he got out cause I have the only key to the gate. Must have climbed the fence.” Left behind in the studio was Blades’ old Yamaha guitar. Jane currently keeps the Yamaha in his collection “as collateral. Not that it’s worth anything. But Blades owes me a new rug.” Apparently, Rusty had passed out drunk on Jane’s couch in Silverlake, leaned over and puked on the rug. The ep was mixed by Mark ‘Salty Dog’ Chalecki at Little Red Book, and a limited vinyl pressing of the record is reportedly being done at Rainbo Records. Raw Studios is releasing the four song ep through iTunes and most major digital outlets. 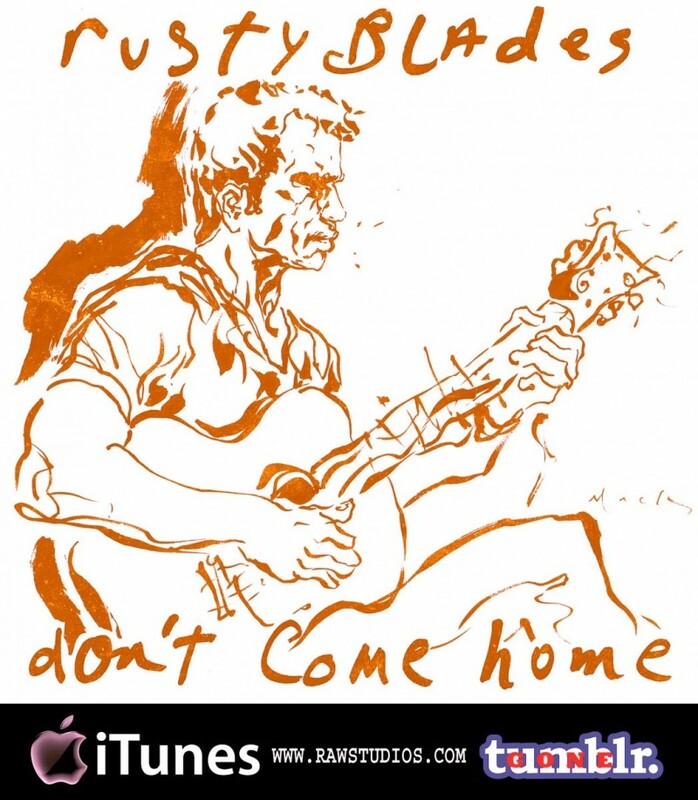 i have a hard time beliving this story but… Rusty sounds great, hes voice is pure country!! Not normally my kind of music but this has an appealing honesty about it, pure and raw (no pun intended), can hear film soundtrack material in places (hint TJ!). Great voice as Denny says, and boy, the guy can play guitar – pleasantly surprised by these tracks, thanks so much for including the full versions here.